The adoption of this Convention is regarded as a milestone in the history of international drug control. The Single Convention codified all existing multilateral treaties on drug control and extended the existing control systems to include the cultivation of plants that were grown as the raw material of narcotic drugs. The principal objectives of the Convention are to limit the possession, use, trade, distribution, import, export, manufacture and production of drugs exclusively to medical and scientific purposes and to address drug trafficking through international cooperation to deter and discourage drug traffickers. The Convention also established the International Narcotics Control Board, merging the Permanent Central Board and the Drug Supervisory Board. The 1961 Convention exercises control over more than 116 narcotic drugs. They include mainly plant-based products such as opium and its derivatives morphine, codeine and heroin, but also synthetic narcotics such as methadone and pethidine, as well as cannabis, coca and cocaine. The Convention divides drugs into four groups, or schedules, in order to enforce a greater or lesser degree of control for the various substances and compounds. Opium smoking and eating, coca leaf chewing, cannabis resin smoking and the non-medical use of cannabis are prohibited. The 1972 Protocol to this Convention calls for increased efforts to prevent illicit production of, traffic in and use of narcotics. It also highlights the need to provide treatment and rehabilitation services to drug abusers. In order to avoid room for difference in interpretation, law-makers (codificators) sometimes deviate from etymological (definiendum plus definientia) definitions. In doing so, they approach the term from the law enforcement point of view. The best example is the definition of narcotics in the United Nations Conventions. Narcotics are substances and preparations that induce drowsiness, sleep, stupor, insensibility, etc., and that these effects (and their rate) are complicated to prove, e.g. during litigation. Thus, the legal definition of a narcotic is whether or not it is listed on the Schedules of the Convention. If it is on some of the Schedules, it is narcotic. The term "narcotic" is believed to have been coined by the Greek physician Galen to refer to agents that numb or deaden, causing loss of feeling or paralysis. It is based on the Greek word ναρκωσις (narcosis), the term used by Hippocrates for the process of numbing or the numbed state. Galen listed mandrake root, altercus (eclata), seeds, and poppy juice (opium) as the chief examples. 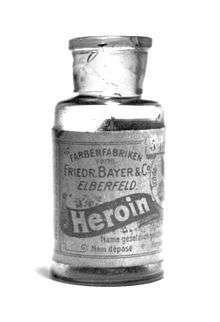 It originally referred to any substance that relieved pain, dulled the senses, or induced sleep. Now, the term is used in a number of ways. Some people define narcotics as substances that bind at opioid receptors (cellular membrane proteins activated by substances like heroin or morphine) while others refer to any illicit substance as a narcotic. From a U.S. legal perspective, narcotics refer to opium, opium derivatives, and their semi-synthetic substitutes, though in U.S. law, due to its numbing properties, cocaine is also considered a narcotic. ↑ Mangione MP, Matoka M: Improving Pain Management Communication. How Patients Understand the terms "Opioid" and "Narcotic." Journal of General Internal Medicine 2008; vol 23:9 1336-1338. ↑ Carl B. Schultz (1983). "NOTE AND COMMENT: Statutory Classification of Cocaine as a Narcotic: An Illogical Anachronism". 9 Am. J. L. and Med. 225. ↑ Convention 1961. Incb.org. Retrieved on 2011-09-24. ↑ Illicit Drugs – Drug Definitions. UNODC. Retrieved on 2011-09-24. ↑ TERMINOLOGY AND INFORMATION ON DRUGS. (PDF) . Second edition. United Nations Office on Drugs and Crime. 2003. Retrieved on 2011-09-24. ↑ PRELIMINARY DRAFT SURVEY ON NATIONAL LEGISLATION ON "COUNTERFEIT MEDICINES". (PDF) . World Health Organization. 4 May 2010. Retrieved on 2011-09-24. ↑ WHO | Lexicon of alcohol and drug terms published by the World Health Organization. Who.int (2010-12-09). Retrieved on 2011-09-24. ↑ 608 F.2d 1135. Bulk.resource.org. Retrieved on 2011-09-24. ↑ J. Richard Stracke (1974). The Laud Herbal Glossary. Rodopi. ↑ Francis Edmund Anstie (1865). Stimulants and Narcotics: their mutual relations. ↑ "De Furore, cap VI" (in Latin). ↑ Julien, Robert M. See A Primer of Drug Action full citation above. ↑ Narcotics Drug Addiction Help Rehabilitation Recovery Resource. Drug-rehab-referral.org. Retrieved on 2011-09-24. ↑ Online Etymology Dictionary. Etymonline.com. Retrieved on 2011-09-24. ↑ General Drug Categories. Fda.gov (2009-08-11). Retrieved on 2011-09-24.